Dust can be separated into two categories: combustible and non-combustible. 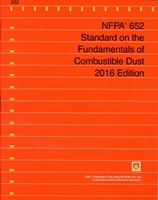 Non-combustible dust, as its name implies, will not under predictable conditions ignite, burn, release flammable gases, or support combustion when subjected to fire or heat. Combustible dust on the other hand, when suspended in an oxidizing medium, will pose a fire or deflagration hazard, regardless of size or shape of the dust. Therefore, a potential dust explosion hazard exists wherever combustible dusts accumulate, are handled, or are processed. The National Fire Protection Association (NFPA) is an international non-profit organization based out of the U.S. that is responsible for creating and maintaining the minimum standards for fire and other hazard prevention. The NFPA was established in 1896 by a group of insurance underwriters focused initially on establishing codes for automated fire sprinklers. Over the years, this organization has created and maintained over 300 consensus codes and standards that influence our lives and safety on a daily basis. At SDC, our Engineering Department stays current on all of the NFPA Standards and can ensure that your dust collection system is up-to-date with the latest requirements.